Bram Stoker never visited here. And as far as anyone can tell, there are not now and never have been any vampires in residence. 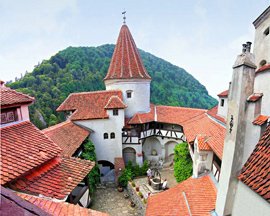 So why is Bran Castle, a lovely, 13th-century palace near Brasov in Transylvania, known far and wide as Dracula's Castle? Blame a mishmash of expediency, misconception and a yearning to connect in some way with the most notorious character in English fiction. The conventional wisdom goes like this: Bram Stoker wrote Dracula, basing his vampire count on real-life, 15th-century Romanian nobleman Vlad Tepes (the Impaler), who was infamous for skewering his enemies on stakes. 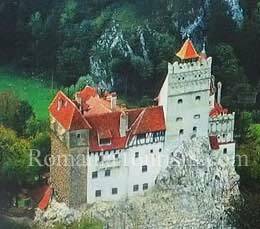 Tepes lived in Bran Castle, which is a dead ringer for Dracula's mountain lair as described in the novel. So, the Stoker-Tepes-Bran connection is obvious. Right? Except that it's also nonsense, says Dr. Elizabeth Miller, a world-renowned expert on all things Dracula. "Bram Stoker never even heard of Bran Castle, and Dracula owes nothing to Vlad's atrocities," says Miller, a retired professor at Newfoundland's Memorial University and president of the Canadian chapter of the Transylvanian Society of Dracula (www.ucs.mun.ca/~emiller/ trans_soc_dracula.html), a society dedicated to the serious study of Dracula in fact and fiction. Miller, debunker of myths about Dracula and Vlad in books, TV shows and lectures, has scoured Stoker's original research notes and found only one significant link between Stoker and Vlad -- the name Dracula. "Stoker was going to call his main character Count Wampyr," she says. "His notes mention a book with scant information about a ruler named Dracula (whom we know as Vlad the Impaler). "Stoker liked the name because, according to the source, it meant the devil." She attributes the confusion surrounding Bran to two sources: a 1972 book In Search Of Dracula, which first floated the alleged Dracula-Vlad link, and guides anxious to satisfy the blood lust of tourists. "I was at a conference in Romania (in the 1990s), and the then-curator of Bran Castle blamed the whole thing on an American group who were on a zip-through tour -- one of those five- countries-in-seven-days things," Miller says. "They wanted to see Dracula's castle." Bran fit the bill, both because of the '72 book and because there are similarities between it and the description of the count's castle in Dracula. When you look at its steep exterior facade, perched on a rocky outcrop, it's not hard to imagine the count scuttling down it, batlike, while his prisoner, Jonathan Harker, watches in horror from a window above. Western interest in Dracula has always been irksome to some Romanians, who resent the association of Vlad Tepes, a national hero, with the fictional vampire and the inference that the country is overrun by superstition. At the same time, Dracula is such a powerful icon that it would be silly not to exploit him as a tourist attraction. So, the road leading to Bran Castle is lined with stalls hawking Dracula lighters, T-shirts, mugs, fake fangs. It's a pity because Bran is remarkable in its own right. It's a splendidly preserved medieval structure that has been a fortress, customs post and royal residence; its most prominent inhabitant was Queen Marie, granddaughter of Queen Victoria and wife of Romania's King Ferdinand I, who lived there early in the 20th century. It has soaring whitewashed towers and a picturesque courtyard, while the rooms are connected by winding staircases (and secret passages) and contain exquisite collections of finely carved furniture, painted icons, statues, ceramics and silverware. The castle is set in a charming park where the queen used to walk and take her afternoon tea. Hardly a forbidding haunt of the Undead. BUCHAREST: Old Princely Court and Church. BORGO PASS: Dracula's Castle Hotel, complete with crypt and coffin, built in the 1980s near the spot where Harker was met by Dracula's carriage at midnight for the final leg of his trip to the castle.